For over a decade, at the height of the Art Deco era, The Queenslander news weekly helped city and country women alike keep up with the latest in modern fashion. 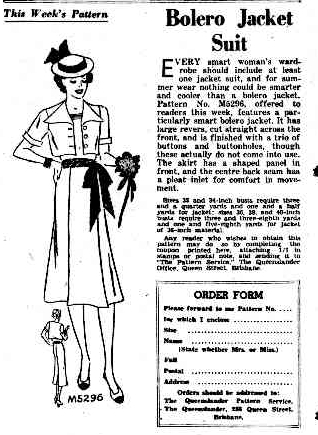 The Queenslander Pattern Service, which went through various incarnations between 1928 and 1939, provided up-to-the-minute dress designs women could turn their hands to at home. At a time when sewing skills were ubiquitous and the do-it-yourself mentality abounded, the pattern service met community demand for the latest styles at an attainable cost, representing a democratisation of sorts in the fashion world. The Queenslander, published by the Brisbane Newspaper Company between 1866 and 1939, was primarily targeted at rural and regional readers looking for a weekly summary of news and articles that appeared in the daily Brisbane Courier. The pattern service was launched on 26 April 1928, as part of the regular “Woman’s Realm” feature. From its earliest iteration it had a distinctly Art Deco flair, with the very first pattern on offer being a drop-waisted coat “for wear over a variety of little frocks”, modelled on a woman sporting a much celebrated symbol of the era – the cloche hat (below left). 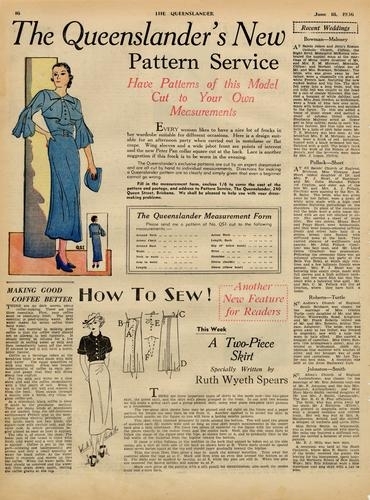 While the service was typical of the modern shift towards standardisation and mass distribution, which reached new heights in the 1920s, it also retained a bespoke element – readers provided their bust, hip, shoulder, arm and leg measurements and received a pattern cut to order in return. In these early years, orders were addressed to “Fileuse” (translated from French as “Spinner”) in the Women’s Department of The Queenslander, along with a payment of 1 shilling and 9 pence for frocks or 2 shillings for coats. Almost six years after the pattern service was inaugurated, on 19 April 1934 an “enlarged and improved” incarnation of The Queenslander was launched with a new cover, a regular page on the “talking pictures”, expanded coverage of agricultural production, racing advice for punters and stories for women “to help solve the hundred-and-one problems of the home”. As part of this overhaul, The Queenslander Pattern Service transitioned from a small black-and-white feature offering one weekly design, to a full page of coloured patterns as “decreed by Dame Fashion” – one free (possibly in response to the economic depression) and the others attracting a cost. However, gone were the days of patterns cut to order and in their place were standardised sizes, with the free pattern available in one size only and the paid patterns ordered according to bust measurement (32 to 40 inches). 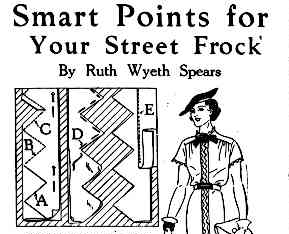 Filling the remaining column space was a new feature of “How to Sew!” articles by popular American writer of home craft and decorating guides, Ruth Wyeth Spears (1895-1990). The articles carried titles such as “Smart points for your street frock”, “Tasteful additions to a stock plain frock: Puff sleeves and a collar you can make at home” and “Gay flowers in wool for spring frocks and hats”. Once more, mass production won out over the bespoke, with a return to standardised sizing. From this point onwards, until The Queenslander finally bowed out of circulation on 22 February 1939, significantly less column space was devoted to the pattern service. The final design offered in the very last issue of the newspaper was for a “Bolero Jacket Suit” that “every smart woman’s wardrobe should include” (below). While The Queenslander Pattern Service changed shape and form over time, it was consistent in helping to bring the latest in Art Deco fashions directly into Queensland women’s homes and onto Queensland streets. In this sense it holds an important place in the state’s social history, however many questions remain unanswered. Who worked in The Queenslander Pattern Service? Who was responsible for the designs and illustrations? Who cut the patterns to order? What form did the patterns and instructions take? How popular was the service? If you know more, please add your comments below so we can keep building the story of Queensland’s Art Deco fashion and design history. All images are drawn from The Queenslander articles referenced below, courtesy of Trove or the State Library of Queensland. 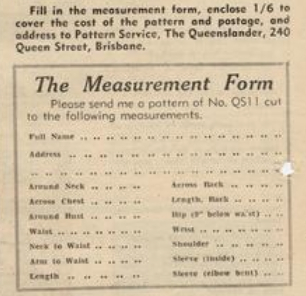 “An Easily-made Style for the Slender Figure” and “Smart Points for Your Street Frock.” The Queenslander. 6 August 1936, p.16. “Approved By All.” The Queenslander. 28 March 1935, p.37. “Bolero Jacket Suit.” The Queenslander. 22 February 1939, p.32. “For Afternoon Parties in the Early Days of Summer.” The Queenslander. 13 August 1936, p.16. 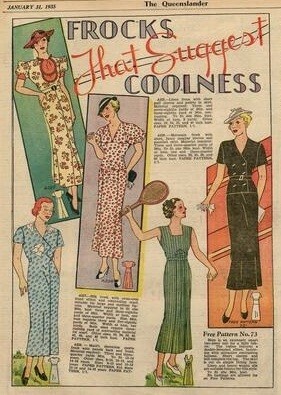 “Frocks That Suggest Coolness.” The Queenslander. 31 January 1935, p.37. “New Feature: Latest Styles.” The Queenslander. 19 April 1934, p.37. “Spotlight on Fashions.” The Queenslander. 21 May 1936, p.16. “The Latest Afternoon Wear is the Jumper Suit” and “Tasteful Additions to a Stock Plain Frock.” The Queenslander. 16 July 1936, p.16. “The Queenslander Commencing With the Issue Date April 19, 1934.” The Queenslander. 12 April 1934, p.3. “The Queenslander’s New Pattern Service.” The Queenslander. 18 June 1936, p.16. “The Queenslander’s New Pattern Service.” The Queenslander. 27 August 1936, p.14. “The Queenslander Pattern Service No. 1.” The Queenslander. 26 April 1928, p.48.